Inspiring & informing the ever evolving design of your home. 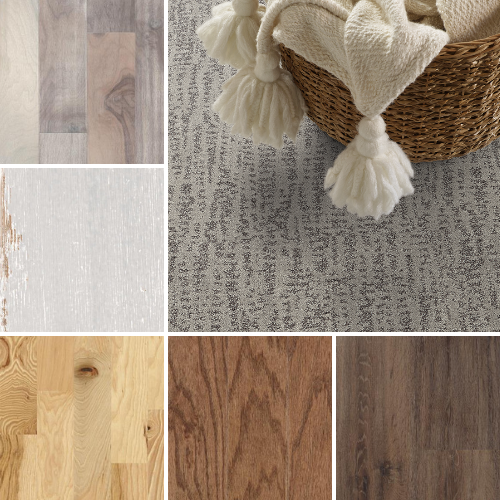 Choosing the right flooring for your lifestyle is just as important as choosing a flooring that looks great in your home. The good news is that there are so many types of flooring in every style that finding that perfect combo is very achievable. You can have a floor that you love looking at, walking on, and caring for for years to come. It's important to consider your lifestyle and share this information with your sales professional when shopping for flooring. For example, those beautiful hardwood floors may have been just what your design sense desired but when your kids and pets got to them, the were no longer the floor of your dreams. 1. What will the room(s) be used for? Play, entertainment, study, etc.? 2. Do you have pets? 3. How many children use the space and how often? 4. Will your family eat or drink in this room? 5. Is there an outside entrance to the room? 6. Is moisture present in the space (basement, bathroom, etc.)? Let's say you are looking for a new floor for a family living space. You have small children but no pets and you'll want to use the space to work, pay bills. There's an outside entrance to the space and you love the look of hardwood. In this scenario, you'll want to look for a hard surface product that offers additional durability. Depending on your price range, there are many options to get the look you crave. The first is to go with a hardwood that is coated to protect the surface from scratches and dents link Invincible Hardwood. You can also choose a laminate product or believe it or not a vinyl product that has the hardwood look you love. Your family comes with kids, pets, and lots of craziness but also lots of love. You need new floors for your living room which gets used on a daily basis as a place to relax and play. It's not the dining room but, let's face it, snacks and drinks are frequently in the space. Comfort is a big priority but there's not a lot of time for chores. Carpet is a great choice for this scenario. It's soft and comfortable. Plus, if you look for a fiber that is protected against stains, like Relax, it's...Lees, clean-up will be easy too. Depending on how often you want to vacuum, you may want to look for a textured or looped style that won't show every foot print. You love to cook and spend a lot of time in your kitchen. You live in a warm climate and you kid are teenagers. Spills are frequent in your kitchen as you experiment with new recipes and you don't want to spend all your time cleaning up. Ceramic tile could be just what you're looking for. Long-lasting and low-maintenance, ceramic tile also feels cool underfoot. If you're looking for something warmer and a bit softer, you may also want to consider a vinyl floor or engineered stone that provides the look of stone you desire. You're single and you love to entertain. You also have a career that takes up a lot of your time. Between social and work obligations, you rarely find time to maintain your home. You're looking for a beautiful floor that you can enjoy without worrying about care and maintenance. A beautiful laminate floor could be just the thing for this scenario. Laminate looks just like real wood. It is build to work in practically any space and is easy to clean. Quality laminate floors like Laminate for Life offer tight seams and a flat level surface that prevents dust, dirt and moisture from seeping under the floor and promoting the growth of mold and mildew as well as a protective surface that resists scratches, scuffs and dents. Whether you're just starting to think about new floors or you're headed to the flooring or tile store tomorrow, take the time to really think about your lifestyle and how you will use the space before you make the final decision.